Difficulty: 5.10. Ten to twelve pitches. Climbers: Nobuyuki “Yuki” Fujita, Pete Walka and Ron Watters. History: Yuki and I started working on the route in June of 2012 and completed the lower portion of the climb on June 30, 2014. The upper route, described here, was completed by Pete Walka and myself on July 21, 2015. Note: Upper Highway to Heaven was included in the 2016 issue of the American Alpine Club Journal. However, editorial limitations prevented the inclusion of a detailed description of the climb. The description and all accompanying photographs are included below. 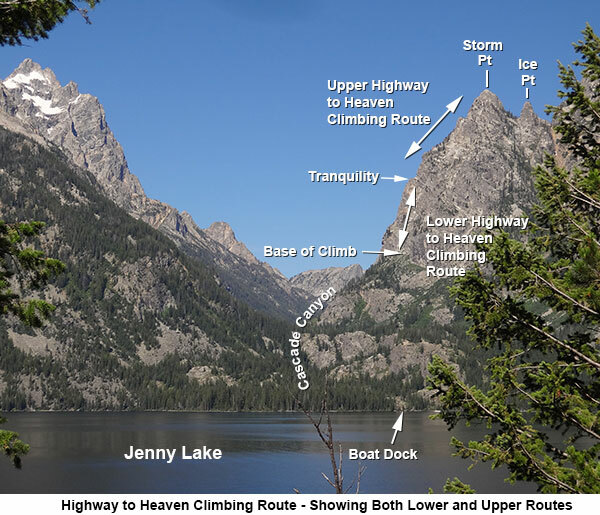 Highway to Heaven is a new route on Storm Point in the Tetons that we reported on in the last issue of the American Alpine Journal and was described in detail here: Lower Highway to Heaven. 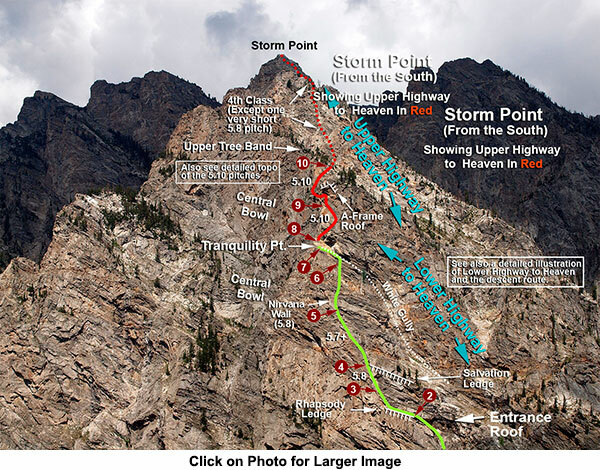 A quick aside: we are quite aware that through the years, the south side of Storm Point has received a fair amount of climbing, and with that in mind, Highway to Heaven would be most accurately labeled a “newly described” route. 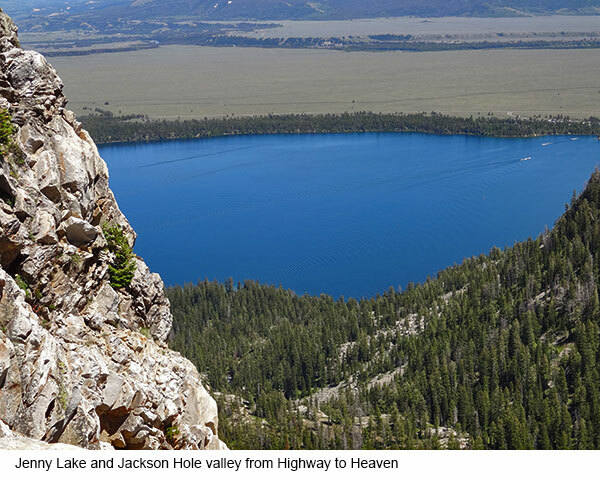 Lower Highway to Heaven is a 5.8 climb on the splendid granite of the peak’s south face and is conveniently located near the west side of Jenny Lake, starting and ending at the same location. It’s slightly easier and closer to the trailhead than Guides Wall (a popular 5.8 climb located a mile farther than this climb), and it serves as a good alternative when things are crowded there. Our description of Lower Highway to Heaven ended at a high point (Tranquility Point). Tranquility was a convenient ending point since from there you can do a series of rappels and return to where the climb starts, allowing you to do the 7 to 8 pitch route comfortably in a day. Beyond Tranquility, a 300-foot high overhanging wall guards the upper slopes of Storm Point. We weren’t sure whether it was possible to climb the overhanging wall without resorting to considerable use of aid, but we hoped to come back some time and give it try. This report is about the return to Highway to Heaven and the route beyond Tranquility Point. For detailed information on how to reach Tranquility, see Lower Highway to Heaven . 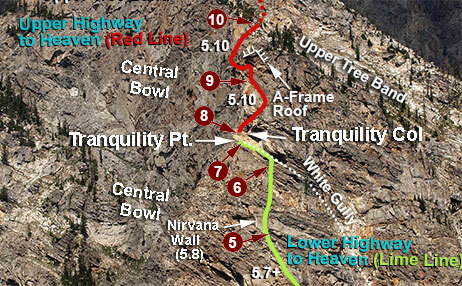 Comparing Highway to Heaven with previously described routes on Storm Peak has been challenging to say the least. It’s challenging, in part, since Storm Point is a complex mountain. 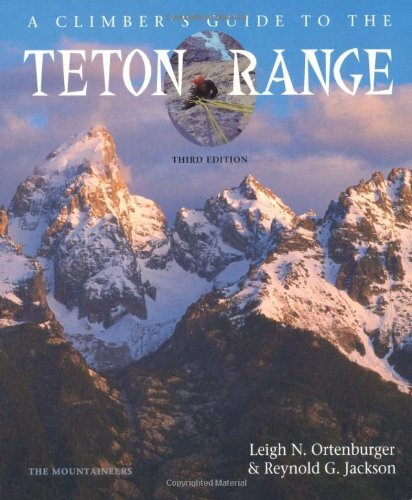 Leigh Ortenburger who authored the bible of Teton climbing, A Climber's Guide to the Teton Range, confessed to being perplexed by its geography. Willy Unsoeld described it "as a real wilderness of broken walls, ridges that disappear and gullies which lead nowhere." William Buckingham called it "bewildering confusion." What is also bewildering are some of the route descriptions. The route closest to Highway to Heaven is the Southeast Ridge which is described in the Ortenburger guide. It is one of three features that Ortenburger identifies on the south side of Storm Point. The concave middle portion is occupied by what Orenburger calls the “Central Bowl.” To the left of the Central Bowl is the southwest ridge and to the right is the southeast ridge. The Southeast Ridge route as described in the Ortenburger guide starts to the east of where Highway to Heaven route begins - that much is certain - but from there to the summit, the description is on the vague side to say the least. Since Tranquility Point is along the Southeast Ridge as defined by Ortenburger, the route must join Highway to Heaven somewhere near Tranquility point or slightly below. We encountered nothing above Tranquility remotely resembling the above description. 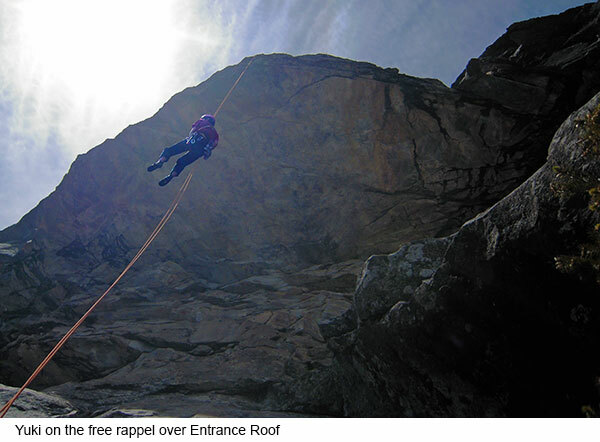 Surmounting the overhanging wall above Tranquility requires at least two pitches with a 60 meter (197 feet) rope. With a shorter 120 foot rope, commonly used by early Teton climbers, as many four pitches might be necessary, all of which would be in the 5.9 to 5.10 range. Yet, other than the “some A1 climbing,” the pitch described in the Ortenburger guide is rated 5.6 – which, again, doesn’t fit with what we found. But more about this later. First, some features to get yourself oriented. Tranquility Point is positioned along the Southeast Ridge about midway from the base of the climb to the summit of Storm Point. It’s a crossroads of sorts. The western edge of Tranquility Point drops dizzily into the Central Bowl, one of the most prominent features of the southern side of the mountain. To the east, there’s a wide U-shaped gully (White Gully) between you and the walls guarding the upper portion of the Storm Point. We’ll get to those walls shortly. Just to the north of Tranquility is a col (Tranquility Col). One side of the Col, the side towards Jenny Lake (to the east), leads down into White Gully. The other side of the col drops into the Central Bowl. Just beyond Tranquility Col are vertical and overhanging walls that reach upward for some 300 to 350 feet. From Tranquility Point, you can see a conifer tree or two signaling the top of the wall. The trees that you see are part of a band of scattered conifers that stretch from east to west across the upper south side of Storm Point. For a reference point, we’ll call this “the upper tree band.” The object is to reach the upper tree band since once there, with the exception of one short roped pitch, it’s mostly 4th class scrambling to the summit. Set up a belay on the col below Tranquility. The route leads up from the col, climbing over some loose rock and then goes behind a house-size block that is attached to the wall. The “house” forms a sort of secret passageway. Secret, because when standing below, it’s not obvious that there’s a viable free route up the wall. However, once you have slipped behind the block, you get a whole new perspective on things. The “house” forms one side of a left facing corner, and the rock is well, it’s good. Really good. At this point and for most of the remainder of this 5.10 pitch, the leader will be out of sight and out of earshot of the belayer, and, if you have them, radios are quite helpful. Climb to the top of the corner (about 40 feet), and then up and slightly to the right (east) through a blocky area to the beginning of another left facing corner. Here you’ll come to a beautiful stretch of crystalline granite. The climbing here is a combination of laybacks, jams and stemming. It’s such a fine stretch of climbing and the rock so magnificent that “Golden Corner” seemed to us an appropriate way of describing it. 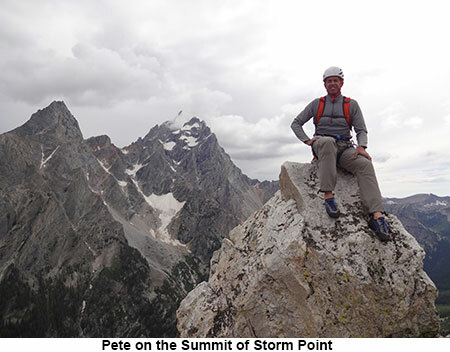 Pete, who led this stretch, remarked that it if the pitch had been found any place other than 8 or 9 pitches up on the side of a Teton peak, it would be a classic that people would be lining up for and clamoring to test their skills against. Climb to the top of Golden Corner and up and over several blocks to a belay stance. The length of the pitch is around 180 feet. We later deliberated on the closeness of the pitons and theorized that they may had been used to aid the route. Was this the aid part of the Southeast Ridge route described in the Ortenberger’s guide? If so, we found equally hard moves in the climbing beyond which in the guide is described as “easier ground.” Moreover, the route is described as if the entire wall can be surmounted in one pitch of 5.6 with some short aid – not two long pitches of challenging climbing as we found. From the way it was written, it appears to be a different location altogether, perhaps farther to the east. Whether the pitches above Tranquility are part of the original Southeast Ridge route or not, the pitons were clear proof that the route had been discovered and climbed long before us. Whoever did it, apparently, either never wrote it up or so garbled the route’s description to make it indecipherable, leaving it for a later generation to re-discover it. Once past the three pitons and under the A-frame roof, traverse left (west) for several feet and then work around a corner, which will again, take you out of the view of the belayer. 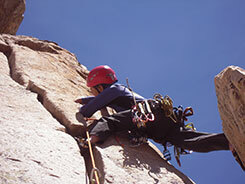 Once beyond the corner, climb a short face on excellent light colored granite (the “White Face”). Then above the White Face, you’ll come to the concluding part of this spectacular two-pitch stretch: the “Pearly Gates.” It’s a corner rather than a gate, but the rock is pearly and you will be ascending skyward (this is Highway to Heaven, after all!) Again, you’ll find yourself on rock so flawless and splendid that it’s a joy to climb. The final few feet of the pitch involve surmounting a slight overhang and then you’ll reach the gentle slopes of the upper tree band. Care must be taken with the ropes on this pitch. The route makes both a traverse and it goes around a corner. Either one of these can create rope drag, and the combination of the two is likely to create major rope drag. Even using a double rope system, we ended up with one of the ropes becoming nearly immovable. Lots of rope flipping and communicating back and forth with the radio helped sort things out. You may want to consider doing this pitch in two parts to avoid a similar situation. From the tree band, coil and stow the ropes. You’ll only use them one more time for a short pitch. You may also want to put on your approach shoes. Look towards the top of the Storm Point. At this point, you can’t see the summit, but rather a rocky “false” summit to the south. (Technically it’s not quite a false summit, but the term “false summit” is a convenient way of describing the feature.) You’ll want to head to a point a couple of hundred feet to right (east) of the false summit over what seems to be the easiest passage. It’s all 4th class scrambling until reaching the side of the false summit. We found that we needed to rope up for one short pitch (5.8) to pass around the east of the false summit. There may be an easier route that doesn’t involve roping up but it eluded us. Once past the false summit, scramble, following the path of least resistance, up the eastern side of Storm Point to its summit. From the summit, the easiest descent to Jenny Lake is to begin by scrambling down the west side of Storm Point, towards upper Cascade Canyon. As you start down the west side, you’ll find something almost resembling a trail which switch backs finally reaching a patch of conifer trees at its base. As you approach the trees, there is some exposed down climbing but the foot and hand holds are plentiful. All this time while down climbing you have been heading west. Once you reach the trees, you’ll swing around to the east to the col between Storm and Ice Points. From here, follow a couloir downward to the east. 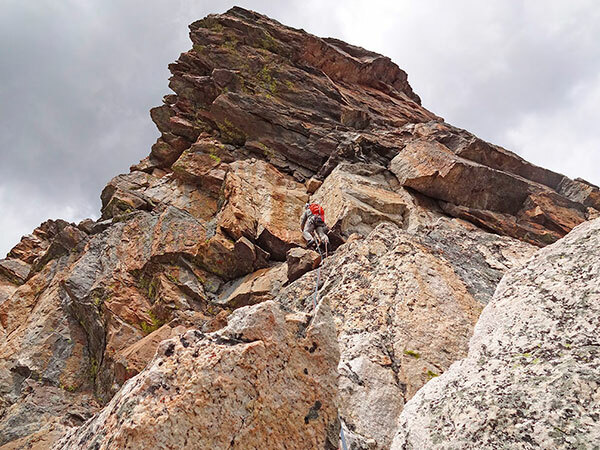 In mid to late summer, the couloir is full of loose rock and you’ll want to stay to either side when possible. At times, however, you’ll need to scramble down the middle of the couloir. Near its bottom, the couloir cliffs out before it joins the large Symmetry Couloir. You’ll need to by-pass this last cliff by descending through the stunted trees to its right (south). 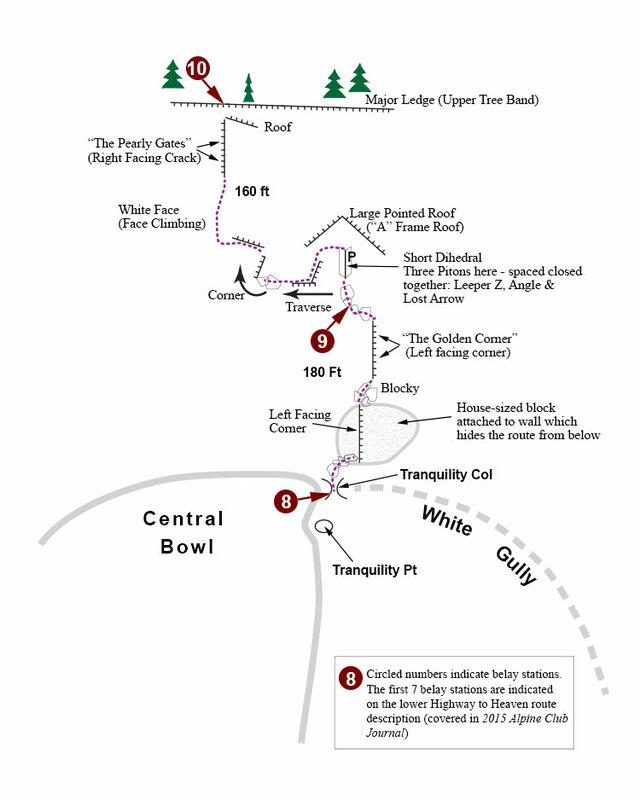 Once joining the main Symmetry Couloir, you’ll find a well-worn mountaineer’s path that you can follow all the way to where it connects with the “horse trail” segment of the Cascade Trail. Turn left when you reach the horse trail and follow it down to Jenny Lake and the boat dock. Time-wise, parking lot to parking lot, it took us all of 12 hours. We caught the first 7 AM boat across Jenny Lake, and just barely made the last 7 PM return boat. If you miss the last boat, plan on an additional 2.5 miles hike back to the Jenny Lake parking lot. If you end the climb at Tranquility, there’s a nice multi-pitch rappel route which brings you back to the starting point. That was described in detail in Lower Highway to Heaven. Since much of the fun climbing is the last two (or three) major pitches above Tranquility Point, it would be convenient to be able to rappel from the upper tree band down to Tranquility, and then follow the multi-pitch rappel route back to the start of the climb. Doing so would be particularly advantageous in the early season. Snow would be encountered in the descent from the summit of Storm Point, and, in addition, to your rock gear, you would need to carry an ice axe and crampons. So, naturally the question arises: can you rappel down from the upper tree band? We weren’t able to see any easy way of doing it. 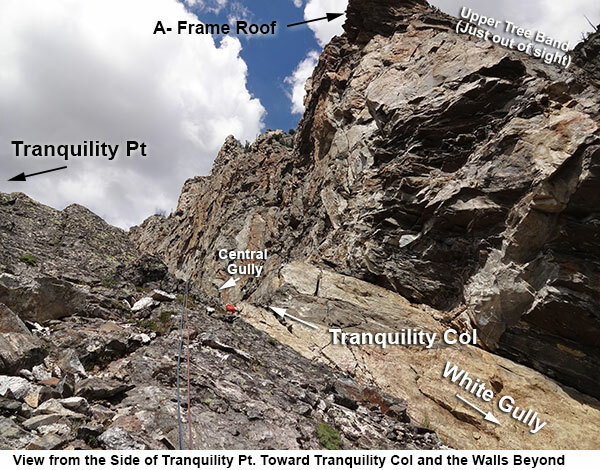 Ideally, you would want to terminate the last rappel at Tranquility Col. If you were to miss landing the rappel at the col and end up coming down to the west of the col, you would find yourself on the sheer slopes of the Middle Bowl. That’s not a good spot. If you were land the rappel to the east of the col, you end up in the White Gully. That might add another rappel, and, additionally, you would need to find a way to climb out. That all adds complexity to a rappel route from the upper tree band. There’s probably some way of doing it, but it would take time and exploratory work to sort it out. Climbing on the south side of Storm Point couldn’t be more appealing. Besides excellent rock, the views are exquisite. 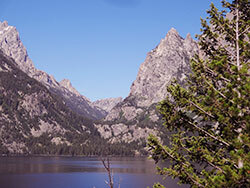 Below and to the east is the deep blue of Jenny Lake and to the west are the soaring slopes of Mt Owen and the Grand. Lower Highway to Heaven, in itself, is a thoroughly satisfying day’s outing. But when combined with the two upper pitches, it becomes a truly exceptional climb.